Hi.. All Narutofans in the world, we are sorry for making you all waiting our new post. Its because since Naruto's update becoming slow, we didn't have much new idea, please forgive us. Ok, back again to this post. Actually, I ever post theme like this, but this theme was so favorite so I tried to make sequel from my previous post Naruto-Sasuke (Friend and Rival) but this time not only between Naruto and Sasuke.. There is another one between them, who is he/she? His name is Pain. 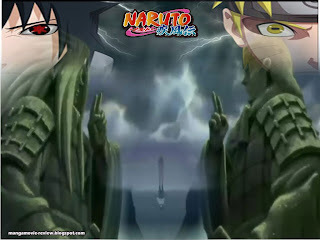 First Wallpaper is about Naruto and Pain battle, as we know both of them have the ultimate jutsu. 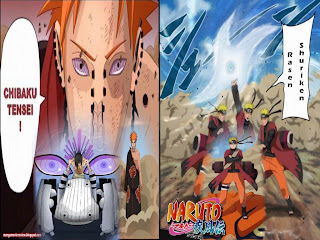 Naruto with Rasen Shuriken and Pain with Chibaku Tensei. They create a great battle when Pain attacked Konoha by him self alone. Only one person could save Konoha from Pain, NARUTO, at that time Naruto has being trained in Frog Mode to mastered Sage Chakra as well. 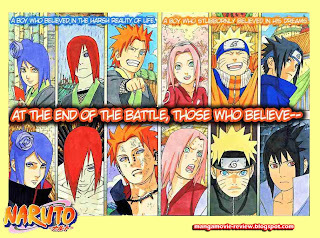 When Naruto's came, Pain has been finished destroy Konoha. Its caused a lot of pain for Naruto. Fortunately, Naruto could able to controlled his pain as well and defeat Pain with his new power. Their battle was very unique, even they are enemy there was something which was made them connected each other. In middle and last of battle, they make important conversation which will determined the future of the ninja's world. See, am I right? Naruto's heart make him different from the other ninjas, his feeling about bond, friendship, chain of hatred and love make him become special ninja. But he is able to become like this because there is someone which always support him become stronger and confidence with his feeling. Sasuke, is the only one person which is support him undirectly to be like that. Supposely, Sasuke also becoming more stronger and believed about his new faith because of Naruto. I miss them their battle, with their new power like now who will be the winner? I wish you all like with my new wallpaper collection. Just click on Image to get the true pixels of it. 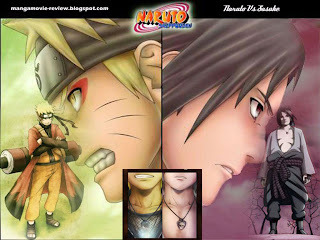 This site have many details about Naruto good.